Gurmehar Kaur has hit back at her critics, including Randeep Hooda, with a biting tweet. 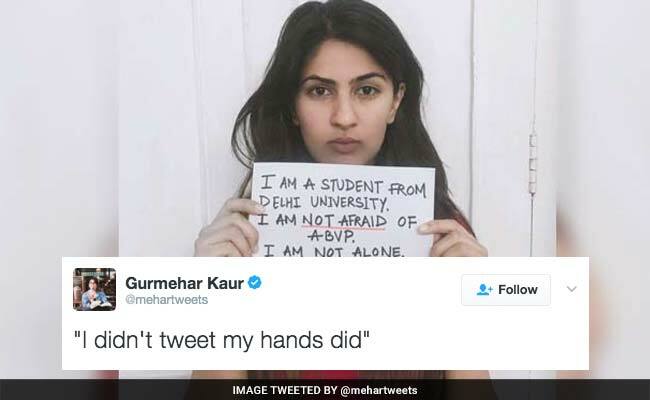 Gurmehar Kaur, the Delhi University student who was trolled recently after her posts against campus violence and student group ABVP, has hit back at her critics with a new tweet. The 20-year-old tweeted actor Randeep Hooda's clarification on trolling her and commented, "I didn't tweet my hands did." Speaking at an event on March 8, Randeep Hooda said that he was not aware of the online threats to Gurmehar Kaur and that his views were misconstrued. "I didn't know who this girl was.. I saw a tweet by Sehwag (former cricketer Virender Sehwag) and I often laugh at his jokes. He makes pretty funny jokes about all kinds of things. And I just laughed at it and left it. I didn't see the connotation in it then I got some messages, and that some prominent journalists are making comments on it, conversing on it," the actor said, according to PTI reports. He added: "I went back to Twitter, and quickly went on to internet and saw what was happening on it. I could put two and two together and I immediately said that don't politicise this poor girl's point of view. And then those two words were taken (out of context), for 'poor' they said that you are misogynist and 'girl' they said you are a sexist. I said 'Hey if it was a boy, I would have said the same thing'." Gurmehar Kaur's biting response has set Twitter on fire. There have been almost 1,000 retweets and over 1,500 'likes' in just 11 hours. @mehartweets WOW! what a comeback.. seems like she was waiting for this moment BANG ON !! Gurmehar Kaur, the daughter of an army officer who was killed in action in 1999, was threatened and abused online after her post criticizing the ABVP, a BJP-linked student body. In the controversy, her old post resurfaced and drew fresh reactions. In the post, she holds a placard that reads, "Pakistan did not kill my father. War did." Among those who derided the post were former cricketer Virender Sehwag, who was then praised by Randeep Hooda.